With the help of Maccabi Tel Aviv greats both past and present, the Flatbush Boys Basketball team officially kicked off the 2015-16 season on Saturday night (10/3) with the first official practice under new Falcon Basketball head coaches Michael Gurock and Gus Kennedy. The event was unusual for a number of reasons. Firstly, it is very much out of the ordinary to conduct such an event over a holiday break. Secondly, it is even more extraordinary to welcome guest coaches to be a part of any team's first official practice session. Yet, that is exactly what took place in the main gym of YOF's Joel Braverman High School. 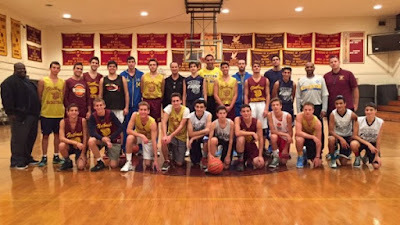 In New York as part of their United States exhibition tour with Armani Milan (Italy), Maccabi Tel Aviv sent a pair of its legendary players along with a trio of home-grown Israeli talent that are part of the present team to help Coaches Gurock and Kennedy put the 2015-16 Falcons through their first paces. 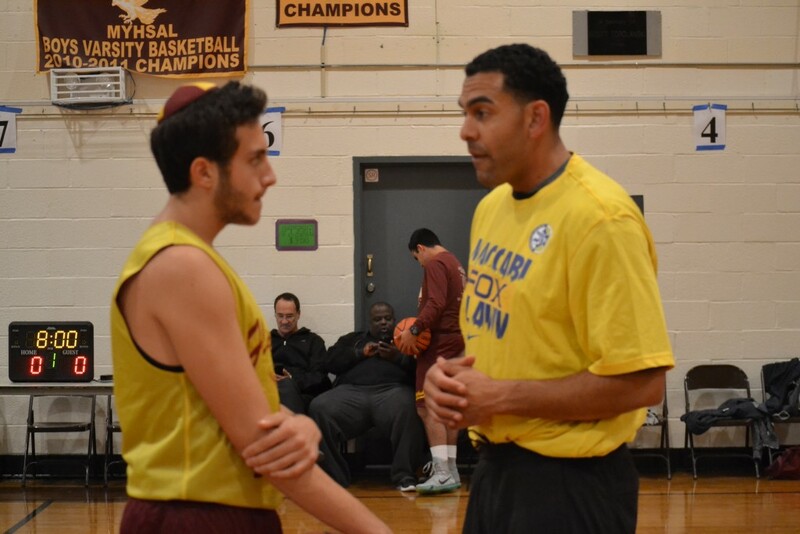 Derek Sharp, long-time Maccabi standout and member of multiple Euroleague championship teams, and David Blu, former USC star and recently retired member of the team's 2014 Euroleague championship squad led a combination of Flatbush JV and Varsity players through a number drills with the aid of present Maccabi players Dagan Yivzori, Yovel Zoosman and Itay Segev. Yivzori and Segev are also members of Israel's national team, and Zoosman is one of Israel's rising stars as a member of the country's under-21 national team. But the young Falcon basketballers received an even bigger treat when they were joined by Israeli Basketball legend Tal Brody, considered by many as the father of modern Israeli basketball and the country's first great international athlete. Brody was a top college player at the University of Illinois in the 60's when he made his first trip to Israel as a member of the United States' Maccabiah team. He fell in love with the country and would soon join Maccabi Tel Aviv, bringing his knowledge and skill at the American game to the young country. In leading the team to its first-ever Euroleague championship in 1977, Brody was a key player in putting Israel "on the map" and bringing respectability as an international athletic competitior. As an Ambassador of Goodwill for Israel, the Maccabi legend shared some of his personal experiences, captivating the young Falcons and instilling pride and encouragement in bringing a positive attitude in striving to achieve ones' goals - athletically, academically and in every endeavor. With the words of inspiration given, Brody turned the group over the the expert hands of Coaches Sharp and Blu. 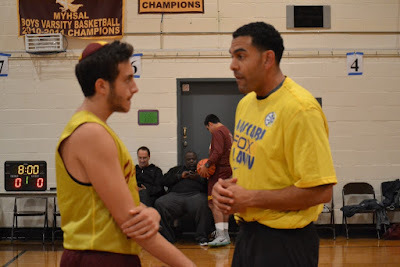 After putting the boys through conditioning and ball-handling drills, the players were divided into two balanced squads, with Derek Sharp given the helm of the Maroon team and David Blu charged with guiding the Gold Falcons. Zoosman sat along side Sharps' players, Segev mentored Blu's charges and Yivzori ran the game clock. Coach Gurock served as game official. Sharp animatedly roamed his team's sideline, amped up and urging the likes of Albert Richter, David Dayan and Isaac Arazi to run the offense and challenge on defense. Blu and Segev took a more methodical approach in guiding Abie Rosow, Jackie Mishaan, Eliot Beyda and their gold teammates as they took a commanding lead. But Sharp would not let that stand. Making sure everyone on his squad got to play, Sharp had his young charges push the play and with a key basket from rookie Jack Rosow, the maroon team slowly closed the gap. But a solid drive to the basket from veteran guard Kevin Haddad provided the edge the gold would need, and the scrimmage ended with Blu's Gold victorious over Sharp's Maroon. Afterwards, the Falcons continued to bask in the glow of having the Maccabi greats on hand to start things off. "This was outstanding!" exclaimed the regularly hyperbolic Senior Albert Richter. "Sharing the court and warming up with the Maccabi players was a lot of fun." Jackie Mishaan took advantage of his time with Zoosman on the bench. 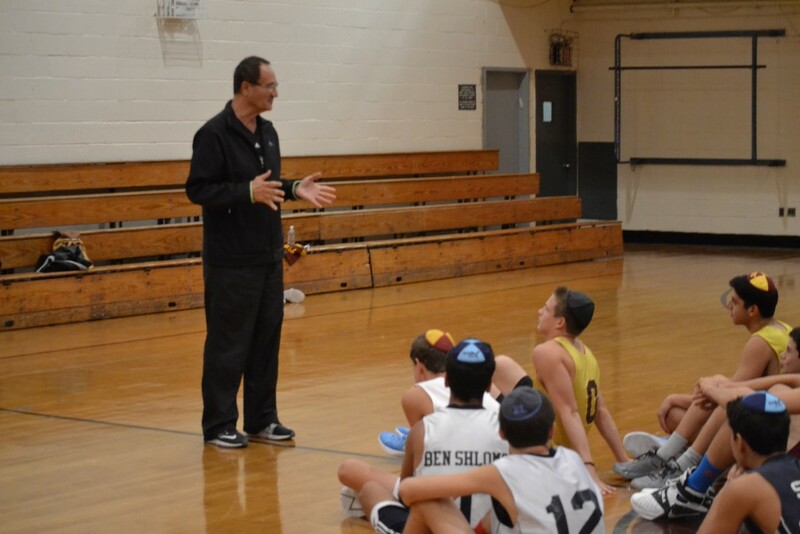 "Just sitting and talking basketball with the Israeli pro was a really cool experience. What a great opportunity this was for all of us." In the end, it was not about the score, but about the process. And with Maccabi on hand, this was a great start to what the Flatbush faithful anticipate will be a most glorious season. And, they will look back and know Maccabi Tel Aviv was there at the beginning, helping set the bar high!